Day four was devoted to Kuchipudi with a presentation by Ratna Kumar (Director of Anjali School of Performing Arts, Texas), one of the earliest graduates of the Kuchipudi Art Academy, Chennai. She was assisted by Keshav Prasad from Kuchipudi, and artistes of the academy past and present. She spoke about Vempati Chinna Satyam's approach and contribution to Kuchipudi, his belief in maintaining purity and keeping the form strictly classical. In the last 100 years, some eminent Kuchipudi gurus like Vedantam Lakshminaraya Sastry have brought in refinement in movement, introduced women in Kuchipudi, choreographed solo items and so on. One major initiative was the consolidation of the practical and theoretical construct of the dance technique. The study of existing texts on dance led the gurus to make a comparative study of the existing practices in their respective forms with the technical aspects incorporated in the classical texts. This scholarly exercise resulted in incorporating certain unknown or non-existing aspects into their practicing techniques. Codifying and giving a format led to logical progression of the adavu samu. 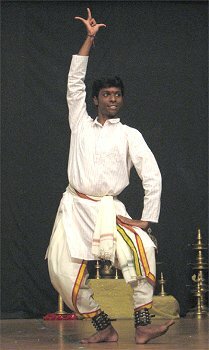 Lots of new adavu samus were added to enrich the Kuchipudi repertoire. Vempati Chinna Satyam developed from the Yakshagana tradition and though they may look new, they are still very much a part of tradition. Adavu samus are like the srichakram; you find that all lines of geometry have gone into the creation of these adavus. There were changes in jathis too. Basic steps as they were practiced 40 years before and as they are being practiced now were demonstrated. Juxtaposing old and new was a revelation. Kuchipudi is the only dance form that uses all 32 chapters from the Natya Sastra. 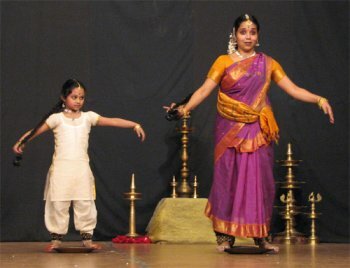 Kuchipudi village is even called Kuchipudi Natya Kshetram. 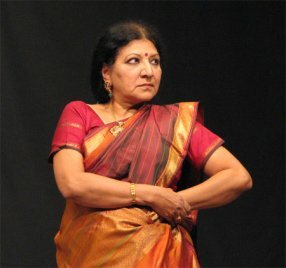 Kuchipudi natya culled its language from not one but four texts – Natya Sastra, Abhinaya Darpanam, Bharata Kalpa Lata Manjari and Bharatarnavam. Vempati Chinna Satyam is a learned person who has great knowledge of the texts, so all that he choreographed was according to the sastras. 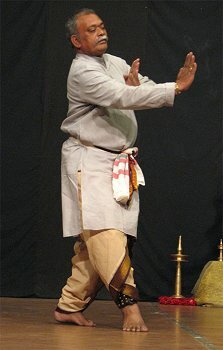 The patra pravesham of Usha from Usha Parinayam was demonstrated by Keshav Prasad as done in the days of Vedantam Sathyanarayana and by Vempati Srimayi according to Vempati Chinna Satyam's choreography. Sometimes, a character can be depicted just by eye movements. One had to learn every movement of a character till the perfection came to the movement and only then would a dancer be allowed to do the role in the dance drama. Many stances were refined by Vempati Chinna Satyam. In his early days of training, Keshav Prasad had to sing and dance. This was alright as long as there wasn't too much movement, but with elaboration of choreography, this made the artistes tired. Now the dancers only lip sync. As a student who joined the academy in 1973, MVN Murthy recalled how for 20 years he had to practice almost every day, sometimes even twice a day, in the morning and evening. Even walk was important. 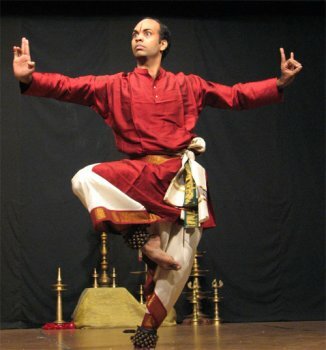 Vempati Chinna Satyam wanted male dancers to walk like males, and if he was not satisfied with some movements, he would immediately get up and show how the movement was done – in a graceful swing. Kuchipudi is a sculpturesque dance, so Master liked to finish every movement sequence in a sculpturesque pose. 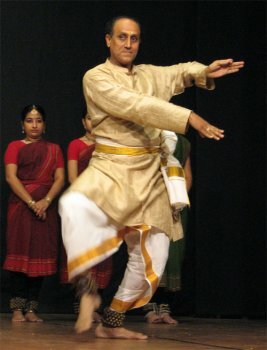 He was one of the first Kuchipudi gurus to use Purandaradasa's verses. He felt that anything beautiful could be used for choreography and made the students realize that language is not important but how suitable the song is for dance. Master's penchant for perfection has come down to all his students, says Ratna. Some of the items performed / demonstrated include a tandava item by MVN Murthy, "Pashyati dishi dishi" by Srimayi, a segment from Muthuswami Diskhitar's "Kanchdalayadakshi," swarajati and swaram of a very old item by Subburaju from Visakhapatnam. Bhujangaraya Sharma translated Tagore's 'Chandalika' into Telugu. An excerpt was performed by Srimayi. "Go anywhere, spread your wings, but make sure you maintain the tradition." MVN Murthy kept this in mind when he choreographed a tarana to one of Pt Ravi Shankar's compositions that he danced on a brass plate. Mother Srimayi and daughter Lakshmi Kameshwari performed together on brass plates and the little one stole the show that morning! The Master's granddaughter is all set to carry on the legacy!